I have recently returned from a trip to Western Canada where I was able to reconnect with the art and culture of the local First Nation communities. It was hugely inspiring to view more of their beautiful artefacts and sculpture, occasionally speak to, and learn, from, some West Coastal people. 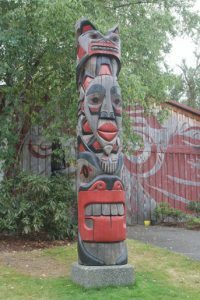 First Nation culture and art are still very much alive and strong in British Columbia, and both are celebrated with pride. Every artefact has a story or meaning, and above all, a deep connection to the natural world. Their customs and memories have been passed down through generations and are still honoured and practised.